Since Barack Obama won the presidential election in 2008, handgun sales have increased by 70%. In fact, during his terms as President, we hit a record high in the number of NICS background checks performed in the history of record taking. Fear of another assault weapons ban or equally restrictive gun control law by Obama’s administration drove America to buy AR-15s, AKs, other MSRs, magazines and ammo. A standard PMag today is $15. During panic buy 2012, they were upwards of $50. Rifles that would have previously sold for $1,000 were marked up to $3,000 and over. 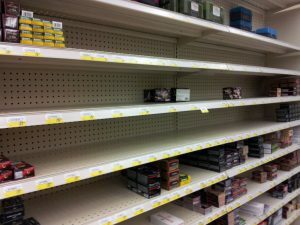 Ammo like .380 ACP, .22 LR and .223 was incredibly hard to find and prices were outrageous. PMags, which normally retail for less than $20 were being listed on popular gun store websites for upwards of $50! There was a panic buy in 2008 and 2012 after the Sandy Hook elementary school shooting. Panic buying is when people begin stocking up on a particular item they fear will soon be in short supply or price gouged. 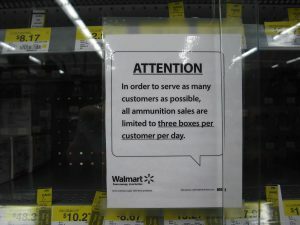 When the supply of an item is in threat of running out, the demand for the product increases, as well as the price. We’ve experienced panic buying after the 1986 machine gun ban, the 1994 assault weapons ban and a ridiculous price gouge on bump stocks after the Harvest music festival Las Vegas shooting. Us Americans aren’t good at being told we can’t have something. What results is higher prices and low to no inventory. Some firearm manufacturers even halted new sales to keep up with production demand! Many places were limiting the number of boxes of ammo customers could buy at one time. The firearms industry now, though still going very strong, has slowed down significantly since the election of President Donald Trump. Some are calling it the “Trump Slump” and even though he told the NRA he is a “true friend and champion” of gun owners, even President Trump pushed for the ban on bump stocks. After the Harvest Music Festival shooting in October 2017 and the Parkland high school shooting in February 2018, the anti-gun politicians and crowd mobilized like they have never before. Though highly unlikely to reach the Senate, the Democratic-controlled House passed the largest gun control bill in decades. The bill includes universal background checks. In a year and a half, we’ll be voting again, and President Trump will be challenged. There are already over 12 Democrats who have declared they are running for president. Though all of them vary, they do agree on one thing—gun control. Another favorite of the left, Beto O’Rourke has voiced his support of an “assault” weapons ban, ban on bump stocks and universal background checks. Buy it cheap and stack it deep now to avoid a panic buy burnout later. And former Vice President Joe Biden, the top contender to win the candidacy (as of this writing) has made asinine comments about firearms. There is no telling how the 2020 election will go but if it looks like Capitol Hill will switch hands, you know they’ll be a run on ARs, lower receivers, standard-capacity magazines (30 rounds and over,) AR accessories and furniture and ammo. Anything “evil” in their eyes will be in high demand. Don’t wait to spend an exorbitant amount of money on things when you could be stocking up now. Subscribe to all the major online retailers of ammo and mags and jump on specials. Most of them send out marketing emails to alert you of specials and sales. Also, keep your eye on ammoseek.com—a website which lists all ammo prices, finding you the cheapest price on the calibers you search for. It is a buyer’s market and right now is the perfect time to buy it cheap and stack it deep. How are you avoiding another potential panic buy? Tell us in the comment section.